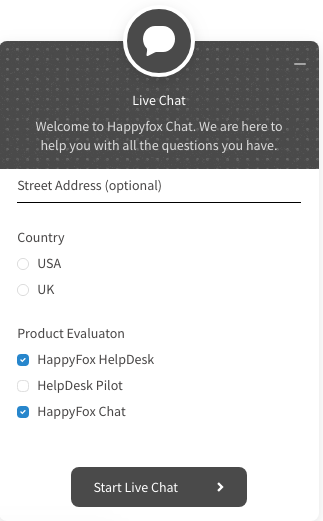 You can now collect additional info from your customers using custom pre-chat fields before starting a chat. How many fields can be created? 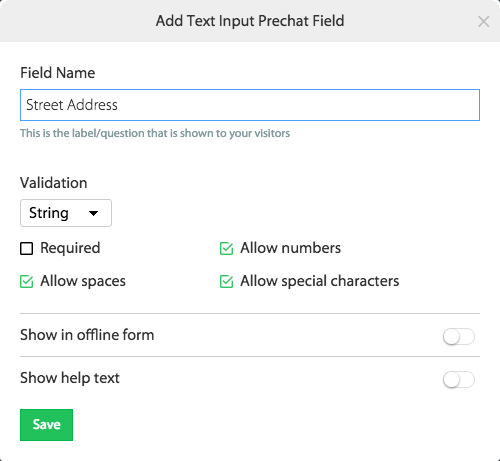 Mighty plan allows you to create 2 custom pre-chat fields. 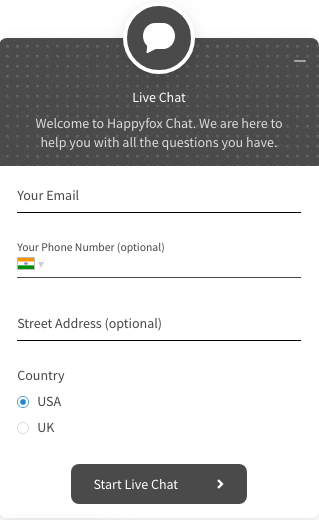 Fantastic and Enterprise plans allows you to create upto 10 custom pre-chat fields. How to create pre-chat fields? 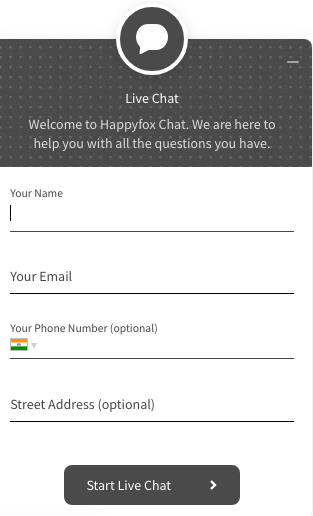 To create additional fields apart from name, email id and phone number, go to Manage >> Pre-chat form. a) To add a text input, click on 'Add field' and choose 'Text Input'. 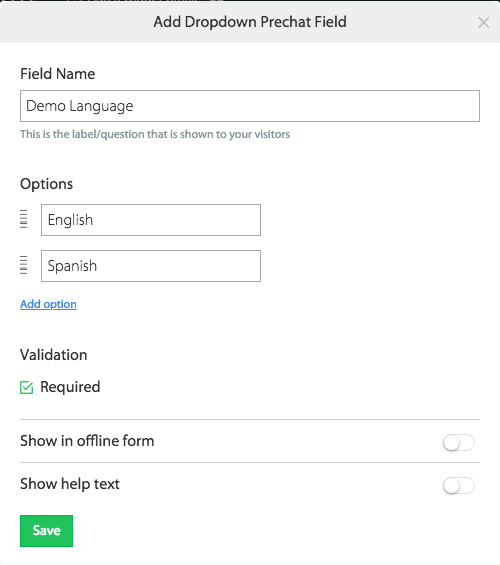 b) In the resultant pop-up, set the name and choose the required validations and the provision to have help text and the field in offline form and hit 'Save' button. 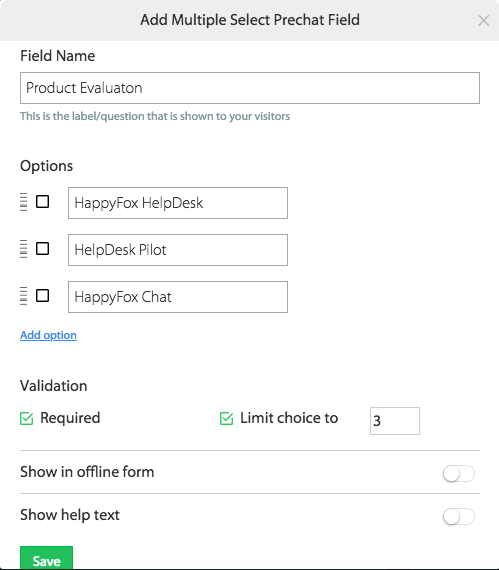 a) Multiple Choice field would allow you to create a field where the customer can choose an option out of multiple choices available in the pre-chat form. b) Click on 'Add Field' and choose 'Multiple Choice' from the drop-down. c) In the resultant pop-up, choose the field name, input the options, incase if you want to have an option marked by default you can do that too and set other validations required and hit 'Save' button. a) Multiple Select Field allows you to choose multiple fields for the field set. b) Click on 'Add field' and choose 'Multiple Select' from the field. 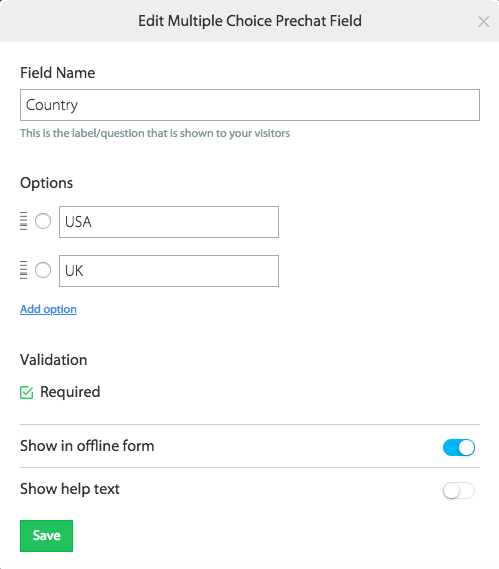 c) You can have the field name, multiple options and also have a limitation on how many options can be chosen and set the validations required. a) Drop-down will allow you to choose the field from the drop down list. b) Click on 'Add Field' and choose 'Drop-down' from the drop down menu. c) You can set the field name and options along with validations and hit 'Save' button. 1. All the text labels have a character limit of 25 characters. 2. All the input fields have a character limit of 50 characters. 3. All the help text have a character limit of 50 characters.